CALGARY – Despite promises by Ottawa and Alberta to backstop the $7.4-billion Trans Mountain pipeline expansion, proponent Kinder Morgan Canada Ltd. said Wednesday the project now faces “unquantifiable risk” because of British Columbia’s increased opposition. Kinder Morgan Inc. CEO Steve Kean said on an earnings call the company is now in discussions with Alberta and the federal government after both pledged financial support to the pipeline project that runs through B.C. Kean said those offers of financial assurances help to alleviate the financial risk, but the project still faces political risk from B.C. “Most of the project and most of the investment is in British Columbia,” Kean said, adding there were still operational concerns about proceeding in B.C. even with Alberta’s and Canada’s financial support. Kean’s are the first public comments on the project since the company announced it was suspending all non-essential spending on the pipeline two weeks ago. “The events of the last 10 days have confirmed those views,” Kean said. The company indicated in a release the risks have increased with the B.C. government’s continued opposition. “Rather than achieving greater clarity, the project is now facing unquantifiable risk,” Kinder Morgan Canada said in a release. “Unfortunately, B.C. has now been asserting broad jurisdiction and reiterating its intention to use that jurisdiction to stop the project,” the company said, adding that Kinder Morgan would not resume spending on the project as a result. The concerns over heightened risks come as a war of words between lawmakers in British Columbia and Alberta escalated, even after Prime Minister Justin Trudeau tried to resolve the dispute in an emergency meeting on Sunday. B.C. Environment Minister George Heyman announced Wednesday that his government would file a reference case with the B.C. Court of Appeal by the end of the month to test whether the province has the constitutional authority to limit imports of diluted bitumen from Alberta. The issue has now escalated to the point where Alberta has introduced legislation of its own to retaliate and send gasoline prices higher in Vancouver. Alberta Energy Minister Marg McCuaig-Boyd threatened Wednesday to use her government’s soon-to-be-passed law to throttle back oil shipments to B.C. “They continue to try to frustrate investors and erode investor confidence and we are prepared to pull the rug out from under them,” McCuaig-Boyd said of B.C.’s plan to file the reference case quickly. “It’s a federally approved project and yet they continue to throw legal challenges all the time and enough is enough. That is why we’ve introduced Bill 12 and we’re prepared to pass it and use it,” she said. Saskatchewan’s government has vowed to match Alberta’s actions in retaliating against B.C. as it supports the pipeline’s construction. “The B.C. NDP government has only gotten more obstructionist since the meeting with the Prime Minister on Sunday,” Saskatchewan Premier Scott Moe said in a Twitter post Tuesday. He has said a bill is coming “within days” to cut off oil shipments to B.C. The pipeline fight between the three Western premiers comes as a new poll shows that in metro Vancouver and on Vancouver Island — the two areas most opposed to the pipeline expansion — a majority of respondents are now in favour of the project. The poll by Angus Reid Institute, conducted this week among 2,125 Canadian adults, found that 55 per cent of respondents said they support the project, up from 49 per cent in February. Still, 26 per cent say they oppose the pipeline and 20 per cent weren’t sure. 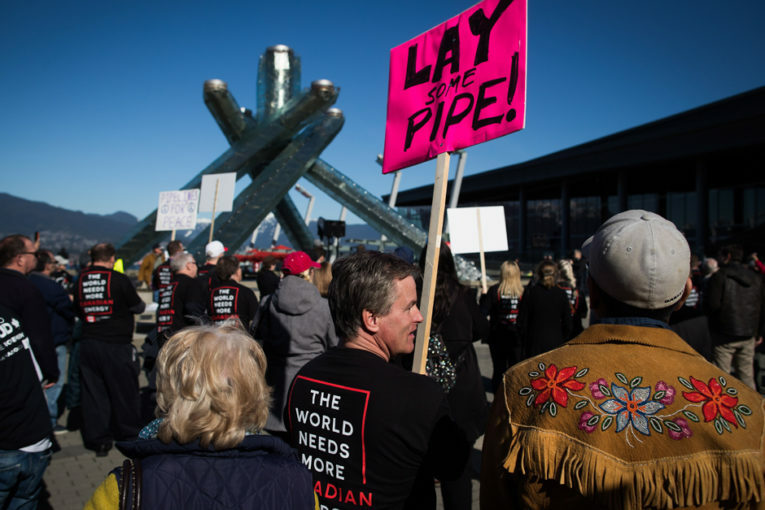 The Canada-wide responses are similar to responses within British Columbia, where 54 per cent of respondents said they support the project, including in Vancouver and Victoria, where the majority of the opposition to the pipeline is centered. In metro Vancouver, 50 per cent of respondents said they support the project, compared with 39 per cent who were opposed and 11 per cent who said they didn’t know. Support was higher in Victoria, where 54 per cent said they supported the project and 43 per cent said opposed it and 3 per cent weren’t sure. In other parts of B.C., support for the pipeline jumped to 60 per cent in favour, 32 per cent opposed and 8 per cent unsure. Meanwhile, the federal Liberal government hasn’t yet “landed” on its promised legislative option to push the Trans Mountain pipeline expansion forward, says Natural Resources Minister Jim Carr. Ottawa is “actively pursuing” legislation that will reassert Canada’s constitutional authority to build and expand pipelines, the prime minister promised Sunday after an emergency meeting with the feuding premiers of B.C. and Alberta. However, it hasn’t yet figured out what it will look like. Government officials say it’s not even yet clear which department will take the lead on the bill — Natural Resources, Finance or Justice. Previous : Corporate Divestiture: WLA Investment Ltd.
Varcoe: Who killed Energy East and what does it mean for Canada?